HOW MUCH DOES EVERYONE LOVE PINEAPPLES RIGHT NOW? I'm on holiday this week so a bit of an interlude to what would have been my regular blog post. I thought though, I would quickly share a recent visit to one of my local National Trust properties, Berrington Hall with it's amazing installation. As I'm sure many of you will love anything pineapple related and/or pink, I for one could not wait to visit this awesome piece of art (it was also the basis of inspiration for the Annie Sloan fabrics I created last week). Look! Look! 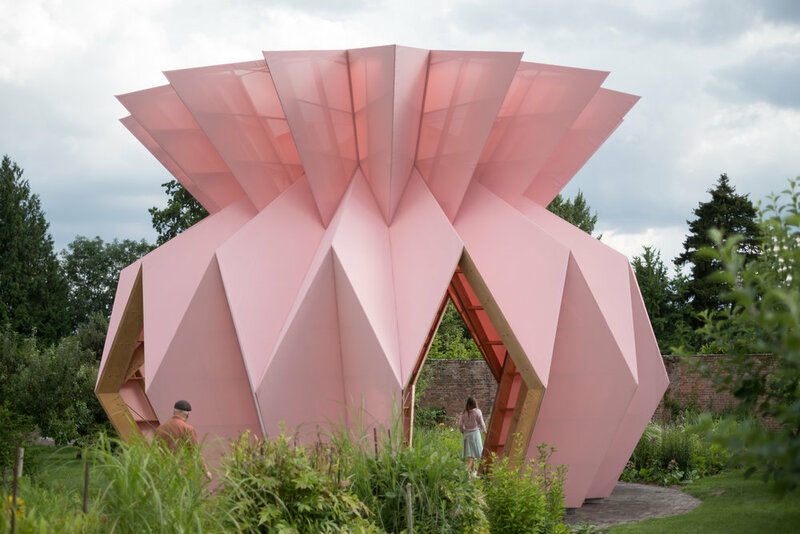 Look!, the title of this amazing pink pavilion, was designed by local artists Heather and Ivan Morison, and sits in the stunning walled gardens of Berrington Hall. Its aim is to highlight the significance of the walled garden and how it would have been a symbol of family wealth and status back in the 18th century, in particular the traditions of importing exotic fruit like pineapples which are believed to have been grown at Berrington - fascinating stuff! 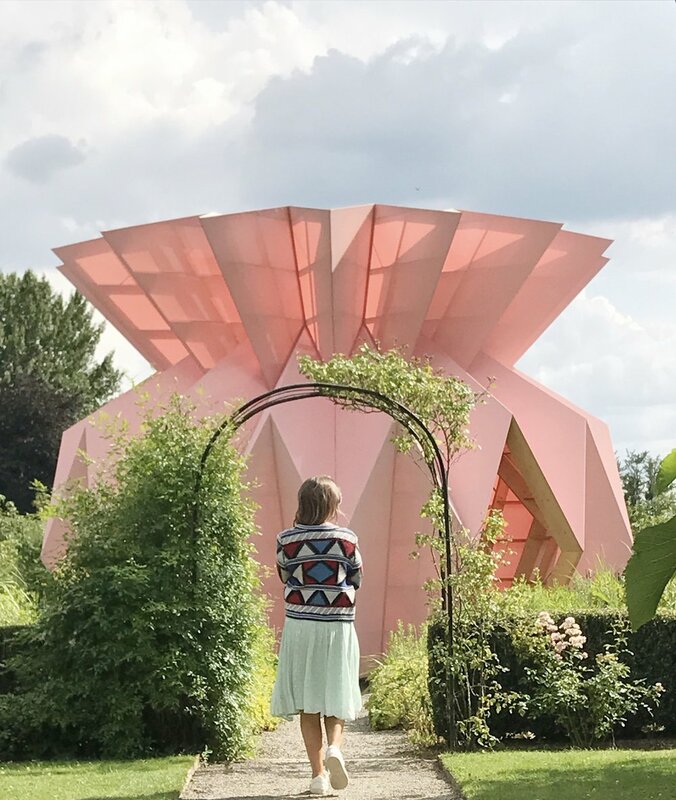 Heather and Ivan Morison first designed the structure in paper using origami (how amazing) and carefully developed it with structural engineers to create the final piece. The glorious pink pineapple pavilion looks amazing from all angles, inside you can see the sturdiness of the structure and the canvas close up which is gorgeous. It was really the colour and shapes that inspired my design. The timber structure is overlaid with an all-wether woven fabric and the colour pink was chosen from a traditionally Georgian palette. I don't think I have ever seen such a glorious pink in all my life, it's so striking and I was desperate to try and colour match it with my fabric dyeing session last week. I love the vivid greens of the garden against the eye popping pink canvas. The geometric shapes within the framework refer to patterns used within the interior design of the house which is very cool and I love that although it's a contemporary structure, it's still really connected to the history of the house! There are little spots to sit and chill inside too so you can take it all in. I could have sat there for hours! Those jagged edges and amazing shapes within the pineapple are utterly fascinating arnt they? So whats not to love about this sculpture, Look! Look! Look! is open to the public until December 2019! so there's plenty of time to come and enjoy and take some cool pics! Find out more about the National Trust and Berrington Hall HERE.